The capsule from our V7 dynamic mic is now available in wireless format as the V7 MC1. "That the V3 feels expensive, well-made, solid is not just cosmetic; in this case, it's an indicator that the designer and manufacturer have applied equal consideration to its sensitivity and voicing." "That's the V3's character: forward, front and pushing on. I like it because it's effortless and honest." "Not sure what else could have been added to improve it; the accessories are perfunctory but good quality. Excellent ergonomics; balanced in hand. Classy, trustworthy feel. Bevelled edge not a gimmick." "With a quality mic in this price bracket, compromises might be expected, but none are evident." "The V7 is well-engineered, solid. It doesn't have a cheap feel. As a hand-held mic the V7 weighs as much as a juicy orange/SM58 and fits balanced in the hand without muffling the capsule." "I was surprised at how well-voiced the V7 is for a mix, closer to a LDC mic than the usual hand-held; a clear bright representation with plenty of detail in the vocal range." "In the V7 sE Electronics have a well-judged product that sits well with the excellent competition and is a level above similarly-priced 'budget' mics...it feels solid enough to last a lifetime in the studio or for general live use." "I think these mics are a useful update to the classic design: the best of the past with design and sonic qualities for the future." Introducing The V Series Dynamics and The X1 A Condenser. Rohnert Park, California, USA - For this year’s AES Show in Los Angeles, sE Electronics is proud to announce the X1 A, a new entry point to the acclaimed X1 Series designed to be the best-in-class offering on the market for home recordists, and bringing the heritage of the X1 Series to an expanded user base worldwide. On the live sound front, sE has also announced a pair of dynamic microphones – a first for the company, known primarily for their industry-standard Reflexion Filters® and hand-crafted condensers. 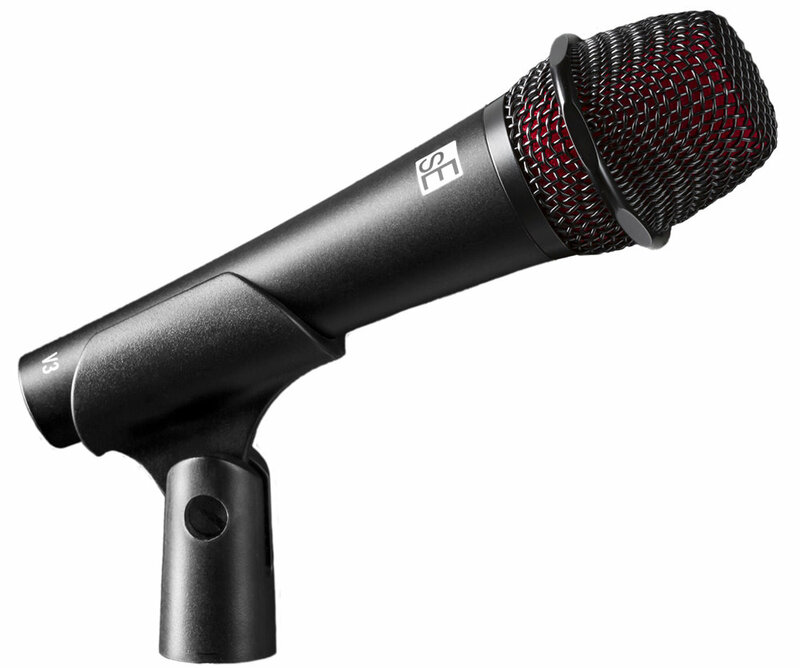 According to sE, the new V7 supercardioid dynamic and V3 cardioid dynamic offer “exceptionally low handling noise, a more natural sound, and higher gain before feedback than other mics in their class”. The X1 A utilizes a newly-developed acoustic design with a carefully selected condenser capsule, low noise electronics, an integrated windscreen, and a gold-plated XLR connector. Just like the acclaimed X1 condenser, it also includes a switchable attenuation pad & low-cut filter and a robust all-metal chassis. The X1 A will arrive in stores worldwide in October 2016, with an MSRP of $129 USD / €129 EUR. It ships with a newly designed mic clip and mic stand thread adapter, and is fully compatible with sE’s Isolation Pack shockmount. Though their studio condensers and Reflexion Filters are already utilized by many high-profile touring acts like Linkin Park and Tom Petty & The Heartbreakers, the V Series marks a direct foray for sE into the live sound world, and their first dynamic microphones. Both the V7 and V3 have all-metal housings and beveled spring steel grilles, internal windscreens & patented integrated capsule mounts to offer excellent sound, superior reliability, and impressively low handling noise. The V7 is a supercardioid model with a specialized aluminum voice coil custom-developed for a “crisp, open vocal sound”, while the V3 is a cardioid model intended for general use on any voice or instrument. The V7 has an MSRP of $129 USD / €129 EUR, and the V3 an MSRP of $89 USD / €89 EUR. Both will begin shipping in October 2016, and come complete with a carrying pouch, mic stand clip & thread adapter.